Home » Oil and Gas » What is LNG? What is LNG - Liquefied Natural Gas? LNG terminals: Cartoon of LNG liquefaction and regasification terminals. 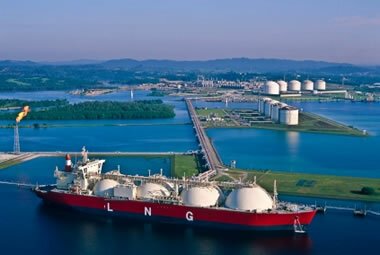 At the liquefaction terminal (left) natural gas is received by pipeline from a well field, liquefied, stored and loaded onto LNG carrier ships. At the regasification terminal (right) LNG is offloaded into storage tanks, regasified and placed into storage. It is then compressed and sent into a pipeline distribution system that delivers natural gas to end-use consumers. LNG carrier ship: An LNG carrier docked at the Bontang LNG liquefaction terminal in East Kalimantan, Indonesia. The LNG is carried in the ship's four dome-shaped tanks. Image copyright iStockphoto / Mayumi Terao. LNG or liquefied natural gas is natural gas that has been temporarily converted into a liquid. This is done to save space - 610 cubic feet of natural gas can be converted into a single cubic foot of LNG. Converting natural gas into LNG makes it easier to store and easier to transport where pipelines are not available. A refrigeration process is used to condense natural gas into LNG by cooling it to a temperature of minus 260 degrees Fahrenheit. This refrigeration process is usually accompanied by treatments that remove water, carbon dioxide, hydrogen sulfide and other impurities. To maintain this low temperature during storage and transport, LNG must be placed into cryogenic tanks - heavily insulated tanks equipped with refrigeration units. When a shipment of LNG reaches its destination or when LNG is being removed from storage, it must be regasified. This is done by heating the LNG and allowing it to evaporate back into natural gas. Regasification is usually done at a facility where the gas can be placed into storage or directly into a pipeline for transport. There are two types of LNG terminals: 1) terminals that convert natural gas into LNG, and, 2) terminals that convert LNG back into natural gas. These are called liquefaction terminals and regasification terminals, respectively. Liquefaction terminals are on the export side of transactions, and regasification terminals are on the import side of transactions. Liquefaction terminals generally receive natural gas by pipeline from a well field. Before it is liquefied, the gas must be cleaned of water, carbon dioxide, hydrogen sulfide and other impurities that might freeze, become corrosive, or interfere with the liquefaction process. Once liquefied, the LNG is sent by pipeline to a LNG carrier ship or into storage to await transport. Regasification terminals receive natural gas - usually by ship - from other areas. At a regasification terminal, the LNG might be temporarily stored or sent directly to a regasification plant. Once regasified it is sent by pipeline for distribution or placed in temporary storage until it is needed. LNG terminal map: Existing LNG terminals in the United States as of June, 2010. Kenai, Alaska was the only liquefaction terminal built for export use. The rest are regasification terminals built for import use. In April, 2012 the Federal government approved a plan to convert the Sabine, Louisiana terminal to a liquefaction facility for exporting United States natural gas to Asian markets. Image after the Federal Energy Regulatory Commission. The world's first large shipment of liquefied natural gas occurred in 1964 when a ship was loaded with LNG in Algeria and sailed for Le Havre, France. Prior to 1964, natural gas in Algeria was a waste product of oil production. It was a "waste product" because there was no local market for natural gas and no pipeline to transport the gas to a distant market. The natural gas was either vented into the atmosphere or flared at the well site. This waste of natural gas and degradation of the atmosphere continues today where there is no market, pipeline or LNG plant to utilize the gas. Today, LNG is exported from locations such as: Algeria, Egypt, Nigeria, Angola, Oman, Qatar, Yemen, Russia, Trinidad and Tobago, Australia, Malaysia, and Indonesia where natural gas production far exceeds the consumption abilities of local markets. In these locations the price of natural gas is low because there is an abundant supply with little local demand. That low price offsets the expenses of building an LNG liquefaction plant, converting natural gas into LNG and transporting it to a distant market. As recently as 2008, demand for natural gas in the United States greatly exceeded domestic supplies. To meet demand, a large amount of natural gas was imported by pipeline from Canada, and several terminals to receive liquefied natural gas from Africa, South America, and the Middle East were built or planned on the eastern and Gulf coasts of the United States. Construction costs for each of these terminals was billions of dollars. Then, the use of hydraulic fracturing and horizontal drilling caused an enormous surge in the production of domestic natural gas. A flood of new production from shale plays such as the Marcellus, Haynesville, Fayetteville, Barnett, and others overwhelmed the market. Domestic natural gas prices fell from over ten dollars per thousand cubic feet down to below two dollars. The terminals built to receive the liquefied natural gas are now underutilized or idle. Now, several companies are working to convert the LNG import terminals into terminals suitable to export gas. Their goal is to move the gas to Asian markets where prices are much higher. Although this sounds like a fantastic idea, a tremendous amount of gas has recently been discovered off Australia, Indonesia, and Southern Asia. These areas have a significant transportation advantage over shipments leaving the Atlantic or Gulf Coast of the United States. Converting the US import terminals into export facilities is a gamble without long-term contracts. Japan, South Korea and Taiwan were the first major buyers of LNG. These areas have very high populations and very little access to domestic fossil fuel resources. LNG gave them access to a clean-burning fuel that was easy to distribute once pipelines were in place. Many other countries now have regasification terminals. These include: Belgium, Brazil, Canada, Chile, China, France, India, Italy, Greece, Mexico, Spain, UK, and the United States. LNG is stored in heavily insulated storage tanks that are specially designed to hold a cold-temperature liquid. Most tanks are double-wall with an outer wall of thick concrete and an inner wall of high-quality steel. Between the walls is a thick layer of highly efficient insulation. Many facilities have underground storage tanks for increased insulation. No matter how well the tanks are insulated, some LNG will boil off and evaporate as natural gas. This gas is generally removed from the tank. It is either used on-site as a fuel or refrigerated back to the liquid state and returned to the tank. Most LNG is transported in specially designed ships known as "LNG carriers." These ships have double hulls to protect the cargo from damage and as a safeguard against leaks. Smaller quantities of LNG are transported in specially designed trucks and railcars. Natural gas has a much lower environmental impact when it is burned than other fossil fuels. It emits less carbon dioxide, less particulate matter and produces less ash. Although LNG is burned in the form of natural gas, it has a greater environmental impact than natural gas that has not been liquefied. This is because LNG requires an expenditure of energy to liquefy, transport and regasify. After these impacts are considered, LNG has a greater environmental impact than natural gas but generally has a lower impact than burning coal or oil. If one considers that the LNG might have been flared at the source as a waste product, the environmental impact is lowered. Public support for LNG projects is generally mixed - especially on the import side where large numbers of people may be located near the regasification facility. Although some people hope that LNG will bring them a reliable source of economical natural gas, others have concerns that the regasification plant or the transport vehicles might explode or catch fire. Some people are also concerned that LNG facilities are terrorist targets. Although LNG has an excellent history of safety, these concerns cannot be assigned a probability of zero. The geography of natural gas is constantly changing. New natural gas discoveries, new pipelines and new LNG terminals can boost local supplies. An increase in local supply can lower prices which can stimulate demand. Growing demand can raise prices, stimulate drilling activity, launch pipeline projects and attract investments in LNG facilities. The geography of natural gas is dynamic.